Good luck, have fun and may the best win!!! Landing in Chicago the first thing I do is freeze to death. how are you doing guys in Chicago? ... any pics available? how many players in total? Great picts thanks for posting and participating. Looks like it was a fun time for all ! None of this could have happened with out Nortrom or Morx who have helped with a lot of everything along the way! We look forward to hosting many more live tournaments over the next years! There was a round 14 players in the tournament. 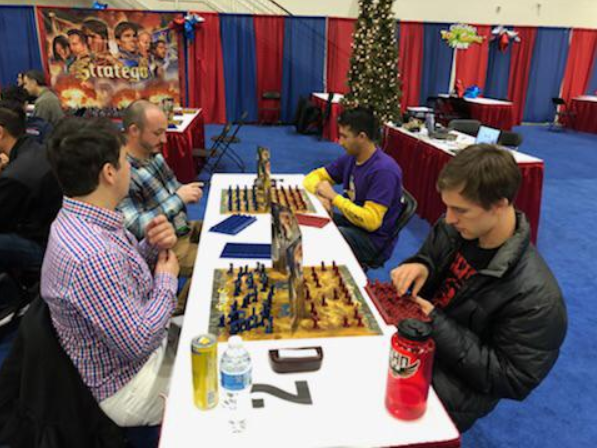 We had space for friendly games for passing people to promote Stratego which had hundreds of people sit down and play! I walked into the huge event room at Navy Pier in Chicago, Illinois and looked around at all the energetic things happening. At one table a young boy was shuffling and stacking cups attempting to beat a time measured in fractions of a second. Who know stacking cups was a thing? Others were playing ping pong, along with a host of other toys and games anyone could walk by and begin playing. Plus, if Star Wars was your thing, a small battle reenactment featuring Chewbacca and Darth Vader was going on. At first I didn't really see the Stratego area because it was in the back part of all this in the enormous hall. Then I noticed a face I'd seen playing Nortrom recently in Europe and realized it was Fks, or Angel as it turns out was his real name. As I got closer he walked right up to me and said "Hello, Gary". I was a bit surprised. How he knew me I don't know but it would turn out to be an omen for how easily he read me later during our one game together, which he won. 🙂 Then I got to meet Ryan (aka Wogomite) and his lovely wife Kari who helped run the tournament by managing the clocks and cracking the bullwhip to keep things on time. In a large area behind them several tables were set up where two games sets were laid out on each one so that two matches could be played simultaneously on each. With so many tables there could have easily been more players accommodated than the fourteen that did play in this first-of-its-kind event in Chicago. But you wouldn't have known it. Many people ventured in and out during the day playing for fun at the extra tables, and so we always seemed fairly full in spite of the smaller official group of players. The game boards used were the Stratego "Original" game sets with European numbering and tall plastic pieces*. Nifty little Bronner clocks provided by Angel himself were in use at each game board and these were quickly explained to those of us who were unfamiliar with them. The games started a brief time after I arrived and my first opponent was, of all people, Ryan. Next I played another newbie and won that game to finish at 3-2 for the day, and apparently good enough for 3rd place. One other player who also plays on the site, Chris (aka Diogenes' Ghost), went 3-2 but my opponents won more than his opponents so I won out 3rd on the tie break. Meanwhile, Swiss Perfect didn't somehow match up Angel and Ryan, who were both undefeated going into the final round, and the tie break went to Ryan after the final fifth round. But wait! Turns out Ryan is too good a guy to accept the victory that way. He agrees to play an extra game with Angel to decide the issue on the battlefield. And like the true warrior he is, he went down in a blaze of glory giving Angel (Fks) the tournament win. I didn't really know what to expect for my first ever live stratego tournament. What would it be like? Would it be fun? Would I knock over my own pieces or my opponent's and get disqualified? 😄 Would it be an event worthy of being called a tournament, or something sloppily done and cheap? I'm happy to report it was anything but the latter, and was definitely fun. Although we certainly didn't have a slew of top flight competitors, the event was nicely run and it worked out amazingly well even with all the hubbub of non-participants moving in and out all day on the extra tables. It was an enjoyable event that exceeded my expectations and hopefully everyone had as good a time at it as I did. Although it couldn't compare, I'm sure, to the actual fort location of the last Tournament in The Netherlands, as a venue today there a rush of excitement in the big Navy Pier hall because of the toy and game fair going on. The company that sponsored the whole thing, including co-sponsoring our event within it along with the NASF itself, was a company called Play Monster. So, much thanks to them! Due to the many games and toys that were on display today and the large number of people in attendance, it added a lot of frenetic energy and brought us decent numbers of the curious because of it. *I had worried about the game boards and the European artwork they might use but that wasn't an issue because of the modern pieces which were easy to play with. (The European traditional major looks just like a colonel to me.) The only problem with the playing of the game for me, as it turned out, was that the numbers were backwards to me, and my opponents other than Ryan and Angel didn't know the names of the pieces and were always calling numbers instead of the names and that confused the heck out of me. I settled upon calling the name and showing pieces to my opponent and that seemed to work fine. Jumbo should really put the names of the pieces on the game divider and/or the game board so that newbies can learn the basics about that. Beautiful read and nice summary Gary. It was a fabulous experience to be at a live tournament with three other online players besides myself. Congratulations Angel (I'm gonna destroy you) FKS for becoming America's first live champion. Although I beat you the second game we played, it did not count as an official result. You earned the championship with the only game that truly mattered between us. Well done sir! Until we meet again . The top 3 would have made a decent podium in any of the European tourneys. Be sure to send in the results to get (updated) live Kleier ratings! How did the tourney go? Congrats Fks, Wogo and Gary! And also with the nice first tournament in USA. Stratego is getting bigger and global! Relatively interesting story about the guy playing Angel this round. This guy works for a company that designs games of all types. He said his favourite game growing up was Stratego and his friends stopped playing him because they could not beat him. He said the reason he joined our tournament was to see how good he really was and sure enough he won his first two games. It was not until he started playing the online players that his question was answered . I also want to thank Nortrom and Morx for helping to make this happen. They were the ones that went to their contacts at Jumbo and got the NASF and Play Monster connected. It is funny that a group of Dutchman were the necessary component for getting two American groups together. Im starting to wonder if Nortrom and Morx have more power than the mafia. In any case, they sure did come through for the NASF and the promotion of this beautiful game. We were able to get Stratego games sold and share with many how to further their online Stratego activity. Morx and Nortrom, you truly are an asset to this game on an international level.